We advised earlier also to Amitabh Bachchan to exit Just dial when it was hovering in 4 figures as he was holding quite a chunk of the stock as he acted as their ambassador. The company had signed up Big B as its brand ambassador in Dec '10. Big B was allotted 62,794 shares at a price of Rs 10 each in 2011 amounting to Rs 6.27 lakh. Amitabh Bachchan has been a poor investor as his earlier investments like Birla Pacific Medspa, Fineotex Chemicals, M&B Switchgear, Neuland Labs left him bankrupt. Check Justdial Chart here. The stock since being 4 digit has fallen magnificently and now it is again going to get into a fresh leg of fall if the level of 465 is broken. So, if you have been thinking of buying the stock than it is a strict 'No' till the time it shows a continuous uptrend with volume. 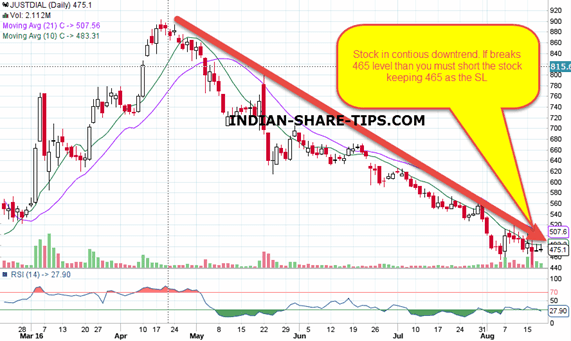 A chart never lies and the state of the stock is clearly visible below and do remember to check our hot stock of the day and start making money like professionals in intraday market with in 2 hours of the opening of the market. We believe trade less but trade accurately.